It seems that when I had the lurgy, just a few days ago, it was just a warm up! I have been confined to my bed, alternating between boiling hot and sweaty and freezing cold and shivering, most of the weekend...I just about managed to work my way through Saturday and today I ventured out for a trip to the doctor. Twice. I had to give the doctor a sample but I just couldn't go...so in the end I came back home, drank a couple of pints of water, and I was back in business. SO after two walks to the doctor I officially have the flu. The doc thought that first of all but wanted to check, and as there has been no phone call it means I'm in the clear...although feeling pretty low. My voice has gone *almost* I'm using A LOT of tissues and I am sleeping loads, this afternoon I napped for 3 hours!! So I got home from work picked up my bag of parcels and visited the Post Office. Afterwards I went into the garden to take some nice sunny photos of what I made last night. The sun was shining, the sky was a bright blue...what could go wrong? much prettier than a pile of scraps! As I said yesterday, I have been working on a new range of goodies for Christmas at Mr and Mrs House and today I spent ALL day sewing them....finished off with a quick photo shoot in the garden...I used the rhododendron bush in place of a Christmas tree and it worked OK! I'll show you the results tomorrow! In my own shops felt sales have dipped slightly but I think it could be the weather...people spending more time outside enjoying the sunshine instead of curled on the sofa sewing! Plus I myself haven't spent so much time on the computer .... one day I'll find the perfect balance of work and fun! I have received details of my swap partner for the toadstool swap------------->look over here for the button, and it's Claire! one of my felt customers! YAY! At the mo I am spending my sewing time working on Christmas and Easter designs for Mr and Mrs House....I'll show you when I can, but right now they are tip-top secret! hey! where did Sunday go? I managed to make 3 needle cases, decorated with the massive wooden buttons! Just a quick photo though...the batteries only lasted for one picture!! But they are on charge so I'm sure I'll take better pictures tomorrow. a day that didn't (quite) go as planned! This morning I started to tidy my wardrobe...all my clothes that I don't wear, either because they are old OR because they no longer fit were hanging neatly in my wardrobe, untouched, whilst all my good clothes that I wear all the time were slung all over a chair in our bedroom. Two hours, one bin bag and FOUR big boxes later and it's all sorted and WOW is my wardrobe tidy! You may remember I did this a few weeks ago with my bookcases? I now have a HUGE pile of unwanted belongings queueing up to look for new homes, John and I have decided to do a car boot sale on the Sunday of the next Bank Holiday, hopefully we can turn unwanted goodies into something useful! I am a certified hoarder and if you're not I'm sure you'd have laughed at my indecision over a few old favourites :: it doesn't fit :: it looks worn out :: nothing goes with it anymore :: BUT maybe I'll keep it???? 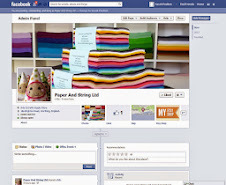 After lunch I packed some orders...the world of web amazes me...today I posted a rainbow of felt to Chile! who'd have thought someone in Chile would find little old me and buy some goodies?? Then I ordered some more felt because I am running low on a couple of colours, sewed a few tortoises, as you do, then added a few items to my ebay and etsy shops. Before I go another Thank You, this time to Fibrespace, who very kindly awarded my blog with an award! It's my day off tomorrow and I have some sewing planned and maybe a little website tinkering...we'll see how I get on! Having spent the day on the sewing machine yesterday, then a quick couple of drinks at the pub with our friends, I decided to make a few small felt cuties last night. I don't know why i didn't think of using the dotty felt before, they look cute! phew-eeee it's hot here today! I'm not good at being hot. It makes me grumpy! Today I've had all the windows and doors flung open and got the sewing machine out so I could play with the new fabric I showed yesterday. I've been in and out of the garden, hanging up washing, eating lunch, having a coffee, but only for 15 minutes or so at a time, otherwise I think I'd have melted! The photos are all of my cupcake cushion...I made it today, I also made the actual cushion bit too, because not a lot of place sell cupcake shaped cushion insides! I enjoyed making this....it's the first bit of machine sewing I've enjoyed doing for a long while. :-) Blog readers really are the sweetest bunch of people! I was reading Kitty's blog yesterday where she perfectly described the way that people she'd never met had become friends, through comments and emails and I have to agree with Kitty...my little corner of the world wide web is a really friendly place to be, and you know what? I LOVE it!! I am feeling WAY better now but still quite worn out! I still was well enough to go to work (I just don't 'do' phoning in sick!) and yesterday and today were really busy, we were run off our feet! Such lovely bright summery colours, available from Buttonberry, a lovely fabric shop-well worth a visit if you haven't already. Yuck. I have the lurgy. A strange stomach ache, like when I was a kiddie, and I still want to curl up in a ball and say 'my tummy hurts' !! And the worst bit is I think the lurgy wipes out your mojo! I didn't sew at all yesterday, and as you know, that's just not like me, firm proof I'm under the weather! 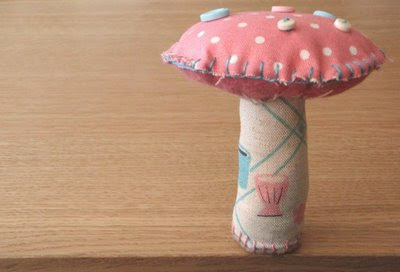 I'm sure you've all seen this gorgeous Toadstool all over the web recently? 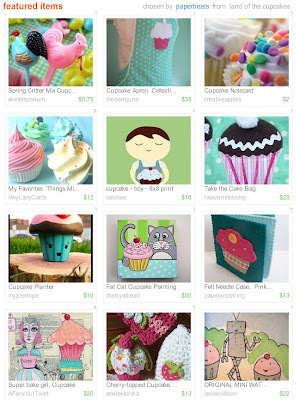 Not only has LucyKateCrafts generously shared a tutorial for these she's now organised a swap! I've signed up and instructions to join in the fun are here. What a great Bank Holiday! On Sunday John and I went to my sisters house and met up with Mum, Dad and Nan, my sister, her husband and my niece. We went out for a nice lunch and chatted a lot and played a lot too! Then on Monday I did a little sewing then decided to tackle our back garden...the weeds and dead-heads were taking over. John joined in too and FIVE hours later our garden is tidy and weed free :-) we felt we deserved a drink so met up with a couple of couples and had a fun night in the pub. Which is why I forgot to do the freebie yesterday! With or with out sprinkles? is the name of the treasury I'm in! you can never have too many cupcakes! 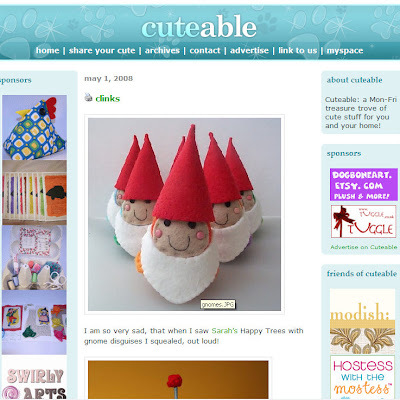 my Happy Tree Gnome Disguises made it onto Cuteable! So now they are officially cute - hurrah! In honour of Cuteable this months freebie will be Happy Trees complete with gnome disguises! To win, tell me what you would name your tree/gnome and John and I will pick our favourite three as winners. Winners will be picked on Monday....what will you name yours? ?